The Czechoslovak statesman Eduard Beneš was president of his country from 1935 to 1938 and from 1940 to 1948. As foreign minister of a small state created from territories of the former Austro-Hungarian Empire after World War I and precariously situated between Germany and the Soviet Union and bordered by hostile Poland and Hungary, Eduard Beneš supported the territorial settlements of the Paris Peace Conference of 1919, was a pillar of the French-East European alliance system, and was a zealous proponent of the League of Nations and of the settlement of international disputes through arbitration. The League's failure to maintain peace and France's refusal to honor its commitment to defend Czechoslovakia against German aggression led to the dismemberment of Czechoslovakia in 1938, and Europe's postwar prostration rendered any challenge to the Soviet-backed coup d'etat in 1948 impossible. Thus East Europe's most noted fighter for international cooperation and collective security lived to witness the defeat of those ideals and the loss of his country's independence. Eduard Beneš was born on May 28, 1884, in Kozlany, Bohemia, the tenth and last child of a Czech farmer. He studied at the University of Prague and at the Sorbonne and Ecole des Sciences Politiques in Paris. He received a doctorate of law at the University of Dijon in 1908 and then studied at the University of Berlin. He lectured at the Commercial Academy of Prague in 1909 and at the Czech University of Prague in 1913, by which time he had become a protege of the Czechoslovak patriot Tomaš Masaryk. After the outbreak of war in 1914, Beneš helped to form a Czech resistance movement in Prague, and in 1915 he assisted Masaryk in creating anti-Austrian propaganda in Switzerland. Traveling to Paris, Beneš, with Milan Stefanik, founded a Czechoslovak foreign committee, which became the Czechoslovak National Council in January 1916, with Beneš as secretary. Under Masaryk the council was transformed into the provisional government of Czechoslovakia on Oct. 14, 1918, with Beneš as foreign minister. In this position Beneš distinguished himself as the leader of the Czechoslovak delegation to the Paris Peace Conference in 1919, and he held this office in all the Cabinets until he was elected second president of the Czechoslovak Republic in 1935. In addition, he was the prime minister in 1921-1922. To preserve the Paris Peace Conference settlements and combat the Hapsburg restoration in Hungary, Beneš helped to found the Little Entente of Czechoslovakia, Romania, and Yugoslavia (1920-1921), linked with France. Leader of the Czechoslovak delegation to the League of Nations from 1920 on, Beneš sat on its Council (1923-1927) and formulated the Geneva Protocol of 1924, which made the arbitration of disputes between League members compulsory. 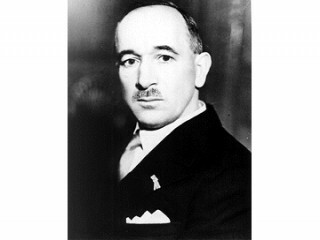 Although he signed a pact of friendship with Italy in 1923, Beneš clearly considered the French and Little Entente alliance systems the keystones of Czechoslovak foreign policy, and when he was approached in 1937 by Austria and Hungary to present joint resistance to expansionist Germany, he refused. Nevertheless, to counterbalance the growing power of Germany, Beneš restored Czech-Soviet diplomatic relations, favored Soviet entry into the League of Nations in 1934, and concluded a qualified mutual assistance pact with the Soviet Union in May 1935. Beneš succeeded Masaryk as president of Czechoslovakia on Dec. 18, 1935. German demands for the Sudetenland brought the collapse of the French—East European alliance system, for Czechoslovakia's allies deserted in the face of the German threat. The Munich Conference of Sept. 28, 1938, awarded Germany the Sudeten portions of Czechoslovakia. A week later Beneš resigned the presidency and left the country. He taught at the University of Chicago, as Masaryk had done. When World War II broke out in September 1939, Beneš organized a Czechoslovak committee in France, but after the French collapse he fled to England, where he created a Czechoslovak provisional government under his presidency on July 21, 1940. To gain Soviet support, he signed a Soviet-Czechoslovak Pact of Friendship, Mutual Assistance, and Postwar Cooperation on Dec. 12, 1943, intending to create the role of East-West mediator for Czechoslovakia in the postwar order. On March 18, 1945, Beneš conferred at Moscow, arrived on April 3 at Košice, Slovakia, to establish a provisional government, and reached Prague on May 10, when his government began nationalizing important sectors of the economy. In the elections of May 1946 the Communists received 38 percent of the vote, emerging as the strongest political organization in Czechoslovakia. The Constituent Assembly elected Beneš president of the republic and the Communist Antonin ZÃ¡potocky president of Parliament on June 19. The Communist Klement Gottwald was selected premier on July 3. Weakened by two strokes in 1947 and unable to withstand the pressure of the Soviet Union and the demands of the Czech Communists, Beneš appointed a government of 12 Communists, 7 Communist sympathizers, and only 2 non-Communists, thereby reducing his own role to that of figurehead chief of state. Although loyal Czechoslovak troops had been ready to oppose the Communists by force, Beneš had refused to utilize them for fear of Soviet armed intervention, thereby sealing the loss of his country's independence. Although Beneš refused to approve a new constitution passed by Parliament on May 9, 1948, providing for a single-list electoral ballot, elections under the new system resulted in a Parliament that was two-thirds Communist. Thereupon Beneš resigned the presidency on June 7, 1948, to be succeeded by the Communist premier, Gottwald. On September 3 Beneš died at his country house in Sezimov Usti. Among his publications are My War Memoirs (trans. 1928), Democracy Today and Tomorrow (1939), and the unfinished Memoirs: From Munich to New War and New Victory (trans. 1954). View the full website biography of Edward Benes.